A crankshaft position sensor (CKS) is used to reference crankshaft rotation as the engine is running while supplying feedback data to the main computer. This sensor is mounted near the crankshaft, flywheel or in the engine block depending on the manufacturers design. As the crankshaft spins it creates an electrical pulse pattern that changes with engine speed. This wavelength controls computer output circuits such as fuel injector pulse width, camshaft and ignition timing adjustments. The reluctor or stator wheel is fastened to the crankshaft which is used by the sensor. This sensor goes by different names depending on the manufacturer, crankshaft angle sensor, CKS sensor, crankshaft position sensor but performs the same function. When these sensors fail they can cause intermittent stalling, no start and random misfires. Usually the sensor will start to work again once it has cooled. Some computer controlled systems may have a difficult time detecting a failing crank sensor because there is other reasons an engine can stop running such as stalling when the clutch is engaged to quickly. Information is compiled from both crankshaft and camshaft position sensors to output camshaft position adjustments performed by the variable camshaft timing actuator-phaser. A knock sensor is used to detect detonation-pinging to further input data for the computer while retarding ignition timing to compensate. A crankshaft position sensor uses a magnetic coil mounted inside a plastic housing while supplying an electrical connector to transfer data to the computer. 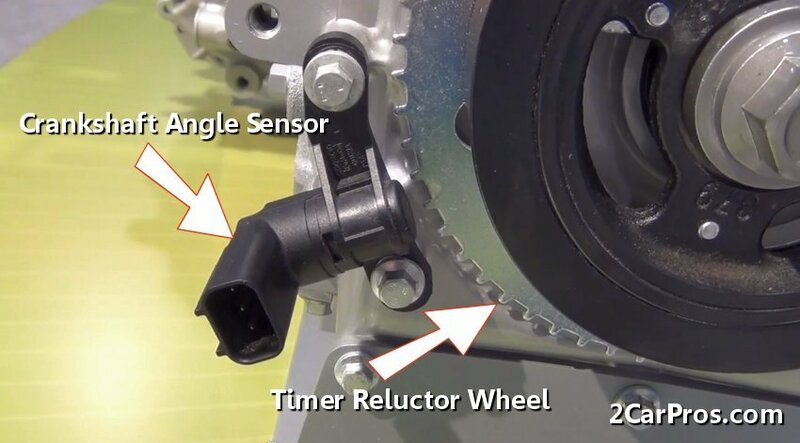 The computer also uses this sensor to gather misfire data due to the temporary slowdown of the crankshaft while the misfire occurs. When the starter is engaged the computer uses the crankshaft positions sensor to confirm the engine is actually cranking over. Once this confirmation is received the computer will signal various relays such as the fuel pump relay and ignition systems that the engine ready to start. When replacing a crankshaft position sensor always use an OEM (Original Equipment Manufacturer) part or equivalent, cheaper sensors do not last as long or perform properly.